Played some sports, it’s 10pm on a Thursday night & companions wanted Japanese. So we’re off to Haymarket/chinatown. This is obviously a day-time photo, but we were there late at night – yes, the pic does show a line out front. 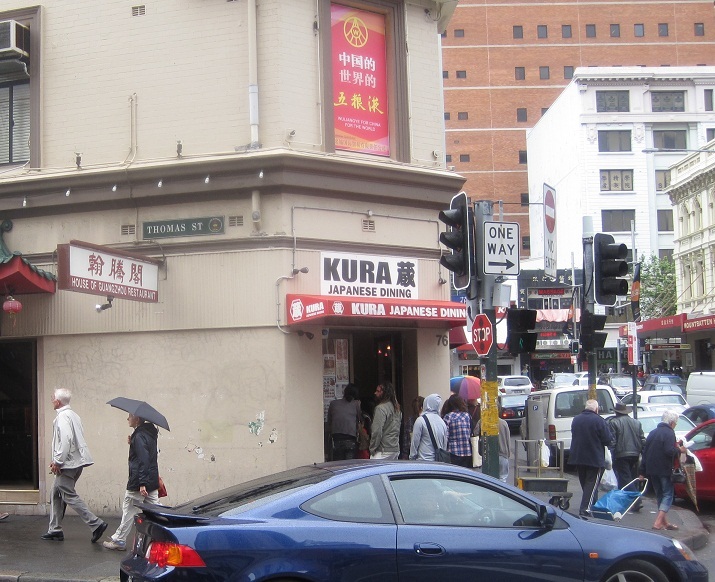 This is a tiny, tiny little place on the corner near George St. There are stools & 2 little tables – place would probably fit max 15 people elbow to elbow – I hope you’re not claustrophobic. They also do takeaway. It was actually still busy when we got here >10pm, a group were just leaving a table though so that was good timing for us. Service is good, instantly given the menu and water as we are seated. The menu is also stuck on the window next to us as well. There is a sign next to me (I should have taken a photo) which says that 1 main had to be ordered per person – it is a very small establishment so I guess they don’t want time wasters who are just there to people-watch. Kura won’t get any points for decor (neither will most asian places), but the staff are genuinely Japanese (they converse in Jap to each other) and the service is good. The order of that the dishes came out was a bit off, 2 of us got our mains, then came the salad, then my last dining companion got his main (after a little mix-up). 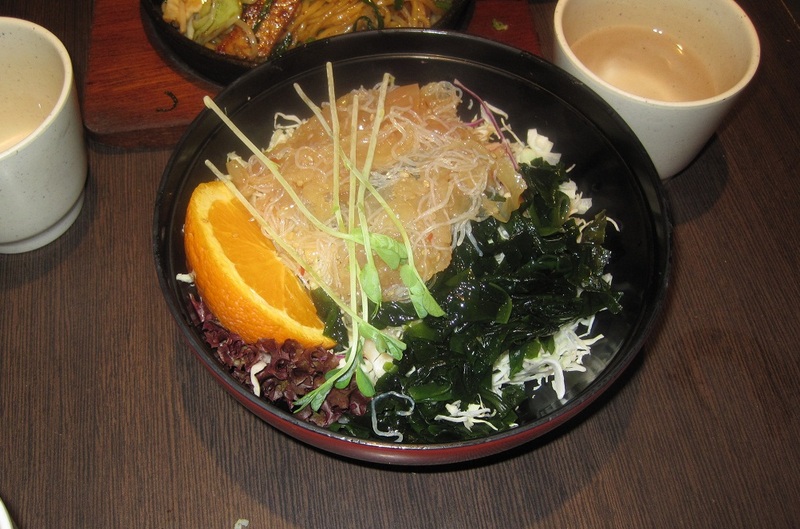 Jellyfish salad – plenty of squiggly jellyfish, seaweed salad with shredded cabbages underneath and some lettuce. This is very nice, if you haven’t tried jellyfish, you should try it just for the texture. A little bit solid, a little bit wobbly – I’m a big fan, it’s also fun to nibble on. 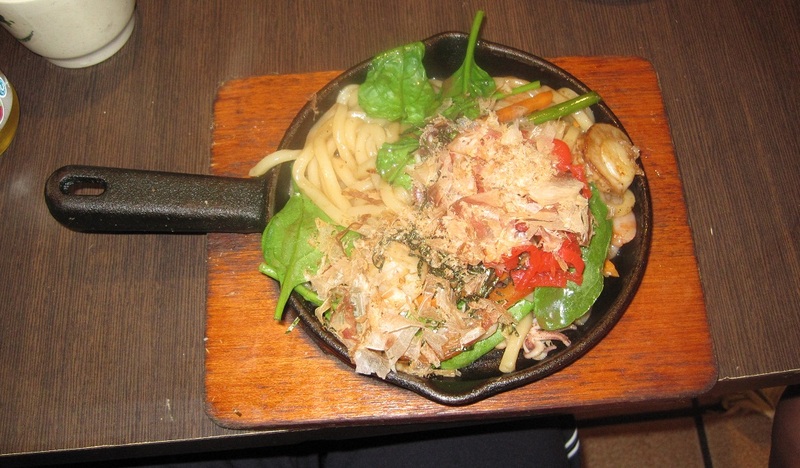 Baby octopus, abalone, carrots, daikon (pickled radish) and udon noodles on a piping hot cast iron pan, covered with bonito shavings (smoked & dried fish which is shaved on something similar toa wood plane). Bonito shavings are so light & thin, that the steam from the meal makes the bonito look like it’s dancing/waving at you. Soba noodles, with cabbage, daikon, spring onions & marinated intestines. I’ve never had asian-style intestines before (I mean, sausages are in intestines, so I’ve had that) so I thought it would be interesting to encourage my dining companion to get this dish. The intestines were extremely chewy but soft at the same time, it was a strange thing to eat – tasted fine, texture was different because it looked like a strip of meat but it wasn’t. It was a good thing the other meals were on the cast iron pan, because we had to wait quite a while for our third companion’s meal. 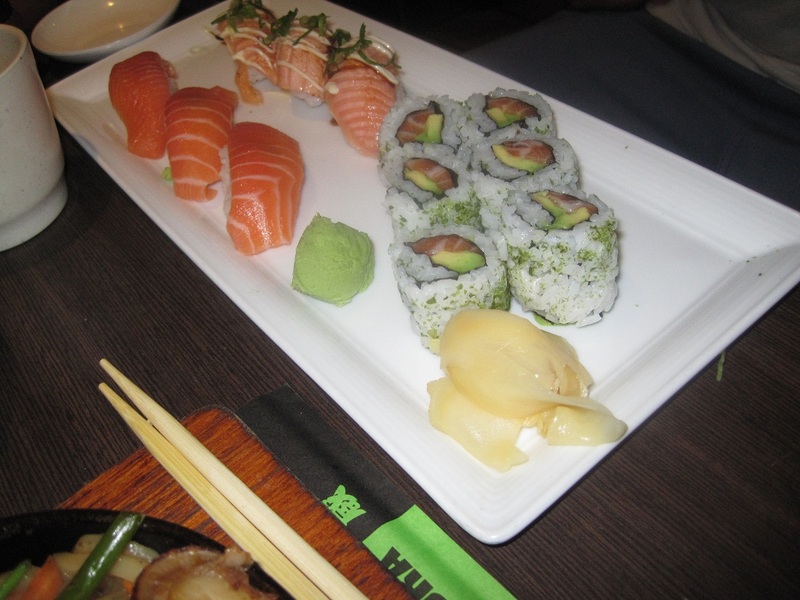 They initially brought out the wrong sushi/sashimi meal before returning with what he ordered. Dunno why it took so long, half his stuff was supposed to be raw! 3 mains & 1 salad ended up being $44 dollars which is not bad for dinner. 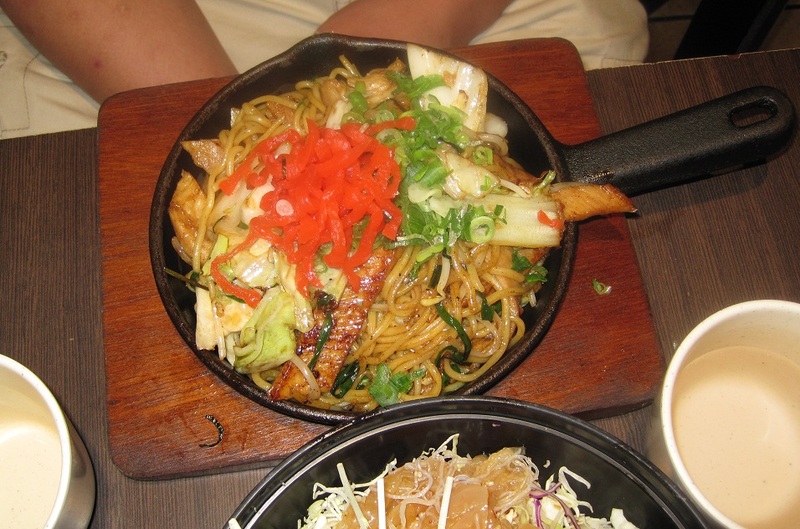 The food wasn’t the best Jap I’ve had, but was great for the price paid. I would go here again, but only if I didn’t have to wait for a table or if I were there to get takeaway – it really is too small to be comfortable in. This entry was posted on November 11, 2010 at 6:44 pm and is filed under 3 - Likeable :|, Asian (East), Cuisine, Dinner, Fair Fare ($15-20), Haymarket, Japanese, Meal Type, Price, Restaurants, Sydney with tags dinner, food blog, haymarket, japanese, restaurant, review, salmon, soba, sushi, sydney, udon. You can follow any responses to this entry through the RSS 2.0 feed. You can leave a response, or trackback from your own site.